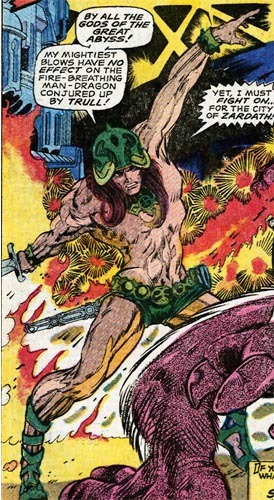 Powers/Abilities: Starr the Slayer was a powerful warrior, armed with a broadsword. History: (Chamber of Darkness#4/3) - Starr the Slayer was the barbarian king of Zardath, and fought off invaders such as the wizard Trull and his Man-Dragon. 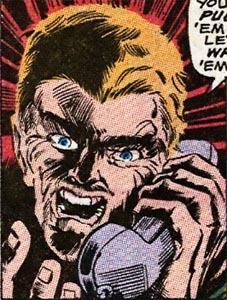 His adventures appeared in the dreams of 20th century writer Len Carson, who wrote stories about Starr for magazines. When Carson developed ulcers, he decided to give up writing, and intended to kill off Starr in his last story, but Starr confronted him on his way to the mailbox. Starr claimed that Carson himself had summoned him there (apparently through his subconscious), and identified Carson as a wizard. To preserve his own life, Starr killed Carson. Starr then awoke from his dream-like experience to find himself back in Zardath, with his minstrel friend Morro nearby. He told Morro that he had just won a battle to save his very soul, and Morro was interested in turning his adventure into a song. Starr returned to Zardath, "and there did rule wisely and justly till the end of his days...and they were many." -- the Chronicles of Zardath. Comments: Created by Roy Thomas and Barry Windsor-Smith. 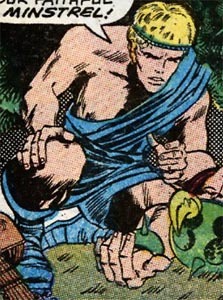 Starr served as a prototype for Conan prior to Marvel's acquiring of the license; Thomas and Smith went on to serve as the creators who brought Conan to Marvel with Conan the Barbarian#1. Starr the Slayer was revived for the Newuniversal line. He appeared in Newuniversal: Conqueror#1 (October, 2008) and a self-titled mini-series Starr the Slayer#1-4 (November, 2009 - February, 2010). 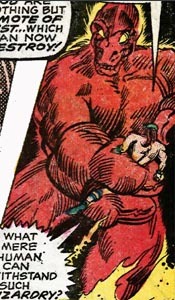 It is unknown if the Starr the Slayer from Newuniversal is the same as the character from Chamber of Darkness#4. Writer Len Carson is probably a parody/homage of real-life sci-fi/fantasy author Lin Carter, who was the creator of Thongor of Lost Lemuria. Morro was the minstrel companion of Starr the Slayer, and would write songs based on his friend's adventures. Len Carson wrote the Starr the Slayer stories for a magazine, basing them upon dreams he would have of Starr's adventures. When he developed ulcers, he decided to give up writing, and intended to kill off Starr. 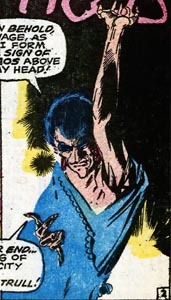 However, Starr appeared in the present day, apparently summoned by Carson's own subconscious, and Starr murdered Carson to preserve his own life. The Man-Dragon was a creature summoned by Trull during one of his attempts to conquer Zardath. Trull was a wizard who believed that he should be the ruler of Zardath, and fought Starr the Slayer on more than one occasion, once conjuring a Man-Dragon to battle him.